Helen Macfie, Pharm.D., F.A.B.C., is Chief Transformation Officer for MemorialCare, a four-hospital, 1,300 bed nonprofit health system including a Medical Foundation and over 2600 affiliated physicians, located in Southern California. Her passion is the attainment of the safest and highest quality care for every patient and family, in pursuit of the Triple Aim for health care. 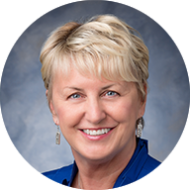 Helen has executive responsibility for facilitation of system level transformation and performance improvement for MemorialCare’s population health, clinical quality, patient safety, risk management, utilization, Lean and patient and family experience initiatives. Additional areas of responsibility include coordination of system-wide strategic planning activities, operational Value Added Teams and executive sponsorship of the system’s Physician Society Board and clinical Best Practice Teams. Helen was recently re-named as one of the Top 50 Patient Safety Experts Leading the Field by Becker’s Hospital Review (2016, 2017, 2018), and sits on the Joint Commission Pioneers in Quality Advisory Panel. She speaks nationally at forums focused on improving health care strategy, physician partnerships to drive quality, integration of lean principles, and performance improvement and patient safety. She serves as faculty for the Institute for Healthcare Improvement’s (IHI) Change, Patient Safety Executive and other courses, has been active on the Board of the California Hospital Association’s Hospital Quality Institute and state Quality Committee, is a member of the Board for California Hospital Assessment and Reporting (CHART), and several California statewide advisory boards (CQC). Most recently she has been serving as part of IHI’s Leadership Alliance, leading a workstream on “Big Waste” and serving on the Equity workstream. In addition, she is a MemorialCare Certified Lean Leader. Helen earned her Doctor of Pharmacy degree at UCSF School of Pharmacy, San Francisco, followed by post-graduate residencies in clinical pharmacy at UCSD and in pharmacy administration at Long Beach Memorial. Her FABC – Fellow of the Advisory Board Company – was earned for completing a two-year fellowship in Leadership of the Healthcare Enterprise for the 21st Century. She practiced as an acute care pharmacist for 13 years prior to moving into her organizational improvement work spanning the last 20+ years. For fun, Helen loves travel, baseball, and movies. Go Dodgers!